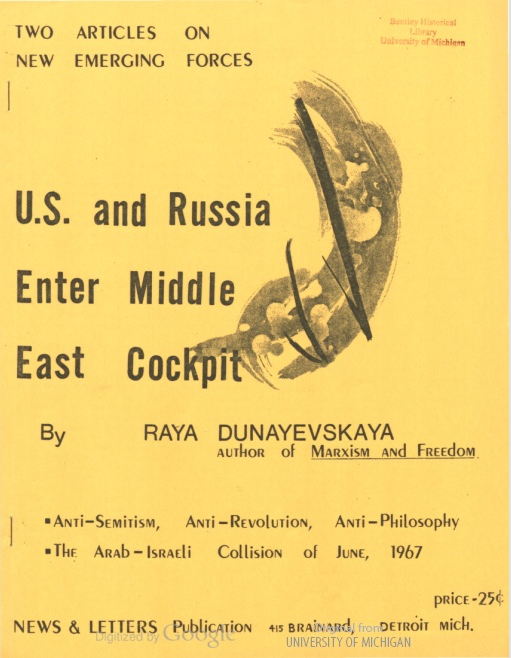 Cover Added to Scanned News & Letters Pamphlet on Middle East | Criticism &c.
The HathiTrust Digital Library has added the previously missing cover to the 1969 News & Letters pamphlet “Two Articles on New Emerging Forces.” This publication contains two texts by Raya Dunayevskaya, “The Arab-Israeli Collision, the World Powers and the Struggle for the Minds of Men,” on the 1967 war and “U.S. and Russia Enter Middle East Cockpit, on Iraq, circa 1969. This entry was posted in Scanned Texts and tagged HathiTrust, Raya Dunayevskaya, Stalin. Bookmark the permalink.